Short on time? Follow this link to a Google Maps version of our guide of what to do in Bondi Beach with all of our favorite spots labeled! You can “follow” the guide, and the saved locations will automatically transfer to your own Google Maps account. At the beginning of this month, Tyler and I flew to Australia to visit my little sister Miriam. Mir has been playing basketball for a team in Adelaide since February, and we really wanted to take the opportunity to see her and explore Australia all together. Since Mir hadn’t visited Sydney yet, we decided to meet her there and spend a few days exploring to kick off the trip. From there, we flew over to Adelaide, and Mir showed us around her favorite spots in the area. And then just Tyler and I spent the last two days of our trip in Melbourne before flying home. Between losing a couple of days with the flight there and gaining a day coming home, we were on the ground in Australia for 8 full days. Another whirlwind trip. We chose to visit over the week of the 4th of July holiday because the 4th fell on a Wednesday this year. Both our companies seemed to quiet down for the majority of the week surrounding the holiday, so it was a great time to go. (We plan most of our long trips like this–read more here). In hindsight, with everything going on in our lives and with me being five and a half months pregnant, an international trip like this was probably not our best call. BUT, we wanted to make the best of it, and we were still really excited to visit Mir. We decided to take each day of the trip as slowly as we could and had a lot of early nights. I’m still recovering, but I am really glad we went. Another thing to note about the trip was the weather and time of year. July is the middle of winter in Australia. The weather in Sydney, though, was totally fine! It was in the mid 60’s and sunny every day–the perfect exploring weather, if you ask me. Adelaide was a little colder, and then Melbourne was uncomfortably cold–at least to us (it barely made it into the 50’s and very cloudy most of the time). So no, not a European winter road trip, but still chilly. However, we actually really liked being in Australia this time of the year because it wasn’t as crowded as we thought it would be. We saw pictures of Bondi Beach in the summer, and it looked insane. So we were really glad to be there in the low season, even if it meant having to wear jackets and leggings every day. In Sydney, we chose to use Bondi Beach as our base to explore the city. Bondi Beach is slightly outside of the main city centre, but it worked out really well. We liked being outside of the busyness of the downtown area, and we loved waking up to the ocean every morning before we set off exploring for the day. One important note: parking was a bit of a hassle and not cheap. We loved having the flexibility of our rental car, but many spots in Bondi have time limits and are pay-by-the-hour during the day. The main parking lot by the beach is free overnight. 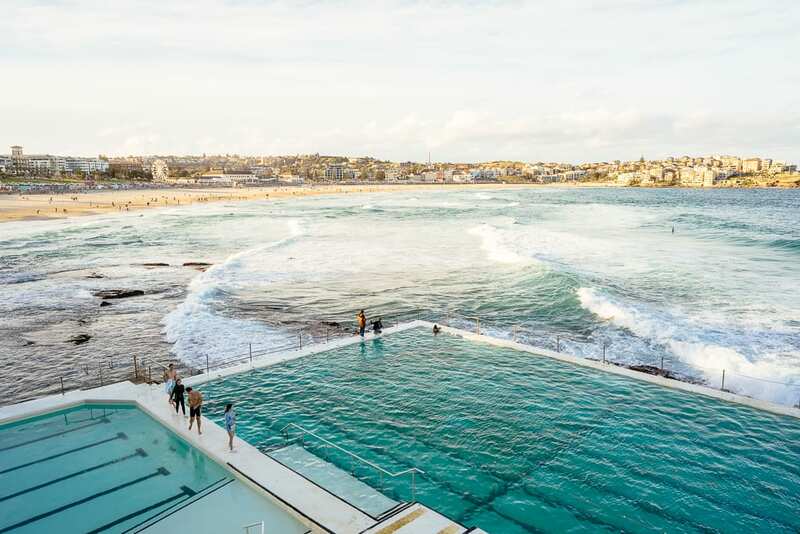 Bondi Beach, when it comes down to it, is your quintessential beach town: perfect blue-green water, over-eager surfers running in and out of the waves, hot people working out everywhere you look, and plenty of fun restaurants and shops to hit. I hesitate to use such a cheesy reference here, but I know all my fellow 90’s girls will appreciate the fact that Mir and I couldn’t help but embrace our childhood practice of pretending to be Mary Kate and Ashley in Our Lips Are Sealed. It was just too easy. This cute little beach town has so much to offer, so we decided to split up our guides and just focus on Bondi Beach today. We’ll do a separate post about Sydney later. Follow our recommendations for a perfect getaway in Bondi Beach. We stayed at Bondi 38, a boutique hotel right on the water that provides guests with fully-serviced luxury apartments. Staying here was definitely our favorite part about using Bondi Beach as a base for exploring Sydney. I love a good hotel room, but sometimes they just don’t cut it. Bondi 38’s full kitchen and open layout apartment, however, DID cut it. Sometimes you need a place to store leftovers, fresh fruit for the next morning, and maybe a pint of Ben & Jerry’s. And with the food in Sydney costing a fortune, it was so nice to be able to cook our own meals if we wanted to save some money. Tip: try Harris Farm Markets around the corner to grab some fresh produce and groceries. Also, the apartment was perfect for having my sister along for the ride. Not to say that the three of us haven’t shared a hotel room before (need I bring up the Last-Minute-Miriam-London-Trip of 2017), but we were able to spread out and get MUCH more settled because we each had our own space. Bondi 38 offers both one and two bedroom apartments to visitors to the Bondi Beach area, and these apartments are SO clutch: full kitchen (as mentioned), in-unit washer/dryer, keyless entry, and a roomy living area to relax after a long day of exploring. I know I mentioned the waterfront aspect of the hotel earlier, but I really want to bring this home. Our apartment was STEPS from the beach, and the views were insane. The location was particularly convenient on our first few mornings, as Tyler and I were jetlagged and struggled to sleep past 5am and were able to hop outside to catch a glimpse of the sunrise (Although you’ll never hear me say the word “sunrise” unless it’s in the same sentence as “jetlag”). I think one of my favorite experiences of the whole trip was our walk from Bondi to Coogee. One of the most amazing things about Sydney is all of the coastal walks made available to residents and visitors. The walk from Bondi to Coogee is one of the most well-known, and it can take anywhere from two to four hours to complete. The paved trail is right on the water and follows the cliffs and turns of the coastline. The walking path stretches from Bondi Beach to Coogee and hits a few towns along the way. In all honesty, we ran out of time and weren’t able to complete the entire walk. We only made it to Bronte before we had to turn back towards Bondi. BUT, just based on the portion of the walk that we did, this walk is an absolute MUST for any Bondi Beach–or Sydney, for that matter–itinerary. The walk is stunning. We stopped in Bronte to watch the surfers for a while which was really fun. Tyler was gracious enough to provide his expert commentary, having surfed exactly one time 5 years ago (though the only proof I ever received of this alleged “surf session” is a blurry photo of him squeezed into a wetsuit). A couple of locals told us that if we were patient enough, we might be able to spot a whale from the trail. They clearly didn’t know who they were talking to. I have to say that Tyler and I happen to have the sort of luck that will keep us from ever seeing a whale in real life (we even paid to go whale watching once and spent three seasick hours wondering if our guide was lying about dolphins technically being part of the whale species and therefore getting our money’s worth). You’ve probably seen photos of the Bondi Beach Icebergs Club on Instagram or Pinterest. Hate to join the bandwagon here, but it really is a must on any itinerary. The pools at the club are somehow situated right in the ocean! The view from the top of the club looking down is gorgeous. Grab a drink at the bar, or do what we did and hit the second floor coffee shop first thing in the morning. We had the club to ourselves, and the morning light over the ocean and pools was breathtaking. Australia doesn’t hold back when it comes to breakfast, or “brekkie” if we are trying to be on brand for the land down-under. There are almost too many places to choose from, but we gladly took on the challenge of hitting as many spots in Bondi as we could in order to find the best. Swing by Porch and Parlor for the “one-hander” egg and bacon sandwich, Lox Stock & Barrel for a homemade fluffy bagel and poached eggs situation that will blow your mind, Vida Surf Shop and Cafe for an acai bowl (not on par with Hawaii but I’m trying to let that go), and Gertrude & Alice for a flat white and a pastry. It’s bad enough that I’m pregnant and dream of ice cream almost nightly. Add in Tyler’s unstoppable sweet tooth and my sister who burns a million calories a day on the basketball court and who therefore has the appetite of a small ox, and you get a trio of Americans who will stop at nothing to get a dessert before retiring for the night. Our picks in Bondi were the classic Ben & Jerry’s and Gelato Messina. I don’t care where you are in the world, Ben & Jerry’s rocks, and there’s no getting around it. And I do love a scoop of chocolate peanut butter gelato, so Gelato Messina was a really good choice, too. Keep an eye out for our post about Sydney coming soon, and let us know if you found this post helpful!